Even if you have been fortunate enough never to have experienced the gut-wrenching feeling of watching your canine athlete return to you on three legs, I am certain you have known or heard of someone in the sport who has. Yes, it is the Cranial Cruciate Ligament (CCL) Rupture we all fear, and for good reason! 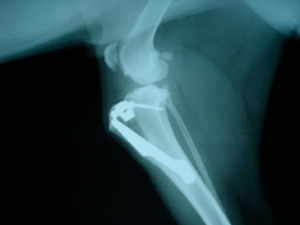 The CCL rupture is not only the most common orthopedic injury sustained by canine athletes, but by Retrievers as well. In this article, I will be discussing the function of the CCL, predispositions to injury, diagnosis, surgical options, prevention and rehabilitation. Note, you will hear reference to ACL ruptures in dogs. The ACL (Anterior Cruciate Ligament) is just another name for the CCL. The Cranial Cruciate Ligament, though small, is responsible for several vital functions within the canine stifle (knee) joint. Unlike humans, whose knee ligaments take on minimal stresses while standing, weight bearing in the dog creates a force that pushes the stifle forward. 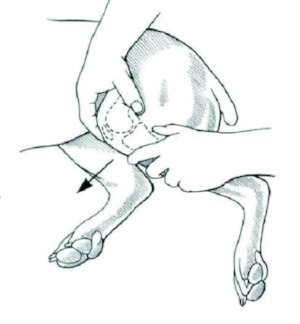 This force, known as the “tibial thrust,” calls upon the cruciate ligament to engage and prevent excessive forward motion every time the dog bears weight. I often refer to the cranial cruciate as the “emergency break” of the stifle. Hyperextension, as well as internal rotation of the stifle, is also regulated by the CCL; these are the two most common mechanisms of injury in athletes. Although there are two cruciate ligaments (Cranial and Caudal), that provide stability in the stifle, the Caudal Cruciate ligament is rarely torn upon injury due to its insertion site on the tibia. Theories abound regarding the causes and prevalence of cruciate disease, but there are several research-based predilections that have been proven. Acute rupture due to hyperextension and internal rotation of the stifle from sudden turns is the number one cause of injury. 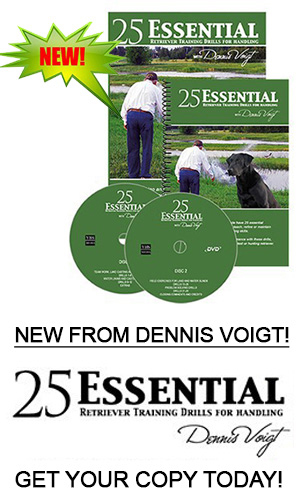 Chronic degeneration associated with aging, obesity and a sedentary lifestyle comes in as a close second. Other predispositions include conformational abnormalities, chronic joint inflammation, hypothyroidism and excessive weight bearing due to a contralateral lameness. Hip dysplasia and medial patellar luxation are two common genetic disorders that place excessive stress on the stifle and, if left untreated, may lead to cruciate damage. Immune mediated polyarthritis, Lyme disease and rickettsial diseases, such as Ehrlichiosis, all cause chronic joint inflammation, which may ultimately lead to cruciate and cartilage degeneration. A partial cruciate tear in one stifle often ends up causing a full tear in the opposite stifle, due to the chronic increase in weight bearing the other leg is undertaking. This is one of the reasons why over 60% of all dogs who rupture one cruciate will suffer either a partial or full tear of the other within 2 years. There are several studies currently underway looking at genetic markers, conformation, and body mechanics in Labrador Retrievers, which will hopefully provide greater insight into why this breed is one of the most commonly affected. Although an acute complete cruciate tear may seem difficult to mistake, as it is a true non-weight-bearing lameness, diagnosing cruciate damage is not always straightforward. Dogs suffering from chronic partial tears will often times present with an intermittent weight bearing lameness that tends to wax and wane depending upon activity level. Others will show an acute, severe lameness, but lack the usual stifle instability found in cruciate deficiency. Many dogs with cruciate damage sit with the affected leg out to the side and have difficulty rising from a sit. Overall, the most important diagnostic tools for determining cruciate damage are your veterinarian’s hands. The orthopedic examination offers critical pieces of information, especially in the ambiguous cases. Within the exam, your vet should be feeling for joint swelling, heat, pain on hyperextension of the stifle, as well as instability. Stifle joint instability is evaluated with a motion called “cranial drawer” (see diagram below). The test is performed by stabilizing the femur bone with one hand and attempting to force the tibia forward and backward, with the joint in extension and flexion. Excessive movement of the tibia in this position is indicative of cruciate damage. However, many patients with a chronic full cruciate tear will not exhibit a positive drawer sign due to the amount of scar tissue that will form over time for the purpose of stabilizing the joint. Drawer motion may also be minimal to absent in partial cruciate tears, except in flexion, when the craniomedial band of the normal CCL is in tension and resists motion. It is nearly always the craniomedial band that is affected in partial tear of the CCL. Gait analysis is often used to aid in diagnosis as well. Closely observing the patient while sitting, standing, rising, walking and trotting, provides a great deal of information related to how the affected leg is functioning. Dogs with even subtle lameness tend to “off-load” or lean away from the injured limb. Some patients, who are considered sound at a walk, are often times lame at a trot or run. Walking the dog in a tight circle may also unmask lameness due to the weight shifted to the inside leg. In example, a right hind limb lameness may be observed when circling the dog clockwise, while a left hind limb lameness would be seen walking counterclockwise. Muscle mass is also an important factor to consider when attempting to judge chronicity of injury. Even subtle differences in quadricep and hamstring muscle girth point to a long-standing lameness that has caused off-loading of that limb. Therefore, it is important to evaluate and compare muscle girth of both hind limbs. 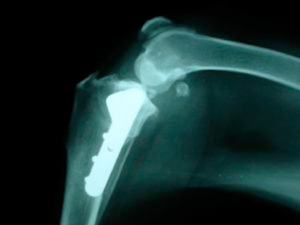 Following the initial physical examination, if cruciate damage is suspected, it is imperative to complete radiographic (x-ray) evaluation of the joint, as well as a second orthopedic examination, under sedation. Many times, either due to pain, muscle mass or brute strength, it is impossible to capture an accurate assessment of joint stability in an awake patient. Likewise, any movement during radiographs can alter the picture, and thus the interpretation. In an acute cruciate rupture, significant joint swelling will be evident on radiographs, with little to no degenerative changes of the cartilage, whereas in a chronic injury, degeneration of the cartilage (osteoarthritis) at the attachment sites of the CCL to the femur and tibia will likely be present. A ninety degree stifle radiograph should always be obtained in order to facilitate joint angle measurements for surgical repair. If radiographs alone are not completely diagnostic, especially in the case of possible meniscal damage, magnetic resonance imaging (MRI) or arthroscopic evaluation of the joint may be indicated. MRI allows for excellent visualization of the CCL and meniscus, and may be utilized to detect subtle defects. Meniscal tears occur in upwards of 50% of acute complete cruciate ruptures and cause significant discomfort during weight bearing, often becoming the primary source of lameness in chronically unstable stifles. Several surgical procedures have been described and utilized over the years in the treatment and repair of stifle joint instability. However, as one of my favourite orthopedic surgeons always says, “If there are numerous procedures for one specific injury, it is usually because they haven’t yet figured out how to fix it.” With that said, it is true that the veterinary world is still somewhat perplexed by the canine stifle joint and its many dynamic functions, but the surgical options available today are viable and effective. Extracapsular stabilization (lateral suture repair) is one of the most common procedures used in the field and relies upon scar tissue development for stifle stability. The Tight Rope System is a minimally invasive method of extracapsular repair, which uses isometric implant placement sites and superior implant material in terms of strength and durability. For the purpose of this article, I will be discussing the two procedures I believe are the best surgical options for the retriever athlete, the TPLO and TTA. A Tibial Plateau Leveling Osteotomy (TPLO) is a procedure which stabilizes the stifle by leveling the tibial plateau and eliminating the need for the cruciate ligament to prevent excessive forward movement of the tibia. Stifle radiographs are used to assess the dog’s current tibial plateau angle (slope) in order to determine the degree of rotation needed to reduce the angle to between 5 and 8 degrees. A circular cut is made at the top of the tibia and the cut bone segment is then rotated to achieve the desired angle. A bone plate is applied to maintain the position of the tibia and allow for the osteotomy site to heal. Complete bone healing should be achieved by 8 weeks post-operative. Advantages to the TPLO procedure as compared to the Extracapsular technique include: earlier return to weight bearing and function, greater predictability of outcome and lower risk of implant complications. Patients who would not qualify as candidates for this procedure would be those who are currently immunosuppressed, either by disease or medication/chemotherapy, and those with active skin infections. Immunosuppression will delay bone healing, while skin infections increase the likelihood of seeding bacteria, leading to implant failure. The Tibial Tuberosity Advancement (TTA) procedure was developed based upon the theory that, “the main vector of the weight bearing force is approximately parallel to the patellar tendon and that cranially advancing the tibial tuberosity so that the tendon is perpendicular to the tibial plateau, will eliminate cranial tibial translation (forward movement) of the tibia. The theoretical advantage of this procedure over the TPLO is that it reduces forces on the patellar tendon, thus decreasing the incidence of secondary patellar tendonitis” (Marti, J et al. Historical Perspective on Tibial Osteotomies. NAVC proceedings. 2012; 855-866). The TTA involves an osteotomy of the tibial tuberosity and the cut segment is advanced forward, forming an exact 90 degree angle between the tibial plateau and the patellar tendon. The opposing forces within the joint cancel out, maintaining the tibia in place during weight bearing. A bone graft is then used to fill in the osteotomy site. Advantages of the TTA over the TPLO include: reduction of forces on the patellar tendon and preservation of the natural position of the tibia and femur, allowing for a more normal load transmission across the cartilage and meniscus. Disadvantages of the TTA as compared to the TPLO include: required bone grafting, inability to correct excessive tibial slope (greater than 28 degrees), tibial torsion will not be corrected. Currently, there are no studies proving that any one procedure is better than another in terms of long term prognosis. However, in my experience, the TPLO and TTA are the most effective when it comes to returning patients to weight bearing. The quicker we can return a patient to full function, the quicker we can relieve the stress applied to all of the other joints of the body, which ultimately leads to a decreased prevalence of secondary injury. No matter what surgical option you may decide upon for your retriever, it is vital that your chosen surgeon is well-versed in the procedure. It is also critical that the surgeon perform either an arthrotomy or arthroscopy of the joint itself to evaluate potential cartilage and meniscal damage. If a meniscal tear is left untreated, it will become a chronic source of lameness, and require surgical correction in the future. Although still a novel treatment, stem cell therapy is being utilized by a handful of surgeons for the treatment of partial cruciate tears of less than 25%, diagnosed via MRI or arthroscopy. Studies are underway to determine if this is a viable treatment option. Stifle rehabilitation is divided into four phases: Acute, Intermediate, Advanced Strengthening and Return to Sport. Even though there are no cookie-cutter protocols that apply to every dog with a cruciate injury, our goals for every phase of recovery remain the same across the board. In the acute phase of rehabilitation (1-2 weeks post-op), our goals include controlling pain and inflammation, maintaining joint range of motion, and averting progressive muscle atrophy. Passive range of motion exercises, icing, laser therapy and neuromuscular electrical stimulation (e-stim) are all used to achieve these goals. Superb pain control is critical at this stage of recovery, as discomfort will inhibit manual therapies and ultimately lead to decreased range of motion and restriction. The intermediate phase (3-8 weeks post-op) is initiated when the dog is approaching full range of motion and is exhibiting no pain or tenderness on joint palpation. Within this phase of recovery, we focus on improving weight bearing and muscular strength and endurance. Laser therapy, massage and e-stim are all continued, with static weight bearing and concentric/eccentric exercises added in. Hydrotherapy is also beneficial at this stage, in the form of either an underwater treadmill or whirlpool. Advanced Strengthening begins in my book at around 8 weeks post-op, or when the osteotomy site has healed, and usually continues into week 12. Goals of this phase include increasing endurance, neuromuscular control and core strength. Proprioceptive and Stabilization exercises are introduced, which usually entails the use of obstacle courses, balance boards and balls, and cavalettis. Land or underwater treadmill conditioning is an excellent form of exercise at this stage. In most cases, the Return to Sport phase of rehabilitation begins around 12 weeks post-op. My personal requirements for this stage are: 1. No observable lameness at a walk, trot or run. 2. No pain or tenderness on joint or muscle palpation. 3. Muscle mass of surgical limb at least 80% of contralateral limb. At this point, sport specific training begins and is carried out three times weekly with one day of rest in between. 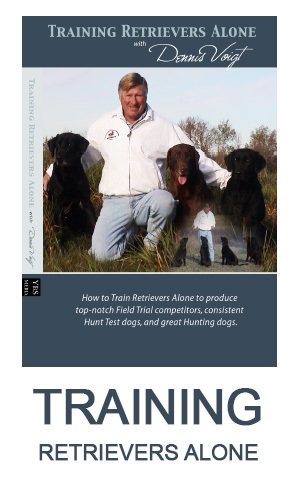 I prefer to start my retriever athletes off with either water marks or water blinds for the first two weeks of training, before returning to land work. Full activity should be performed without any observable signs of lameness, joint swelling, or discomfort on range of motion of the surgical limb. Warming up prior to training, as well as cooling down with a 5-10 minute constant pace walk, should be a part of every session. Placing your retriever athlete in the care or under the supervision of a certified canine rehabilitation therapist is ideal for facilitating return to sport and preventing secondary injuries while recovering. You can find a certified therapist in your state <or province> by visiting, www.caninerehabinstitute.com/Find_A_Therapist.html. Yes, it is the CCL rupture we all fear. Hopefully, though, somewhat less than before you started reading this article. Ultimately, there is no way to truly determine whether our retriever will fall victim to a cruciate injury or not. The best we can do is educate ourselves on the condition itself and gain a better understanding of ways in which we can help prevent injury, as well as properly manage an injury if it occurs. Early diagnosis, surgical correction, and rehabilitation are the keys to returning retriever athletes to full function. After TPLO surgery, a bone plate helps maintain a new angle of the tibia to stabilize the tibia.